Truth by Kbaig: The Goals Behind Unrest and Terrorism in Muslim Countries! The Goals Behind Unrest and Terrorism in Muslim Countries! Muslim countries are facing unrest and terrorism from last few years. 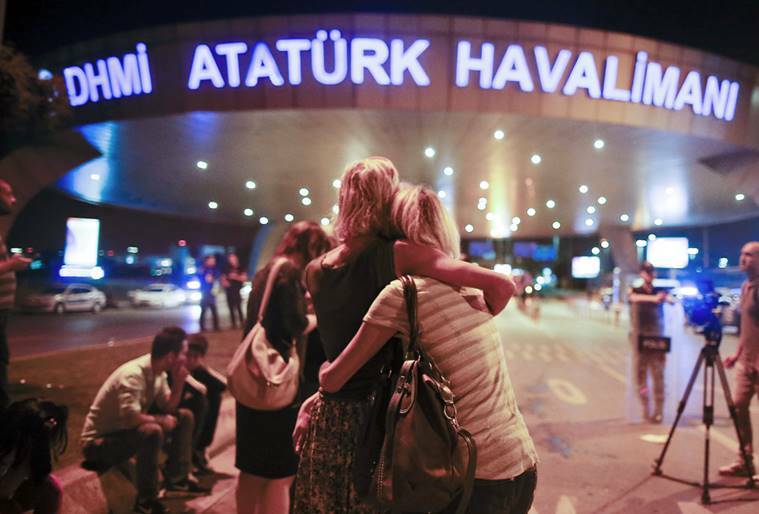 After Pakistan, Afghanistan, Turkey and Bangladesh, terrorists attacked Saudi Arabia. Including Madinah Munawra three cities of Saudi Arabia were targeted by suicide bombers. The suicide bomber wanted to enter Masjid Nabwi. 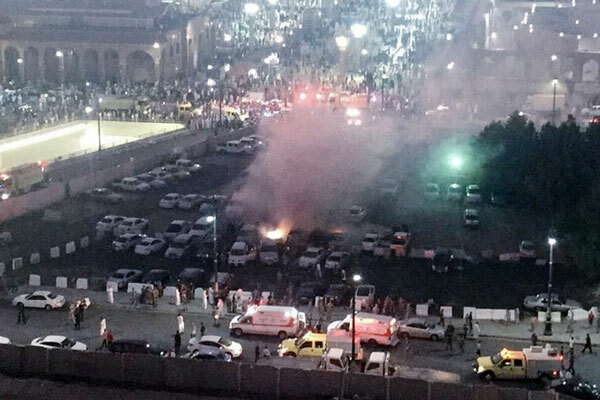 The suicide bomb blasts in Masjid Nabwi Madina Munawra means attack over the whole Islamic world. Prophet ﷺ is not only Prophet of mercy (rehmat) for the Muslims only but blessings for the entire humanity and universe. He ﷺ is Rehmat-ul-Alimeen (blessing for the whole world). The attack over his mosque and city cannot be explained. This is the insult of those who believe in One God whether they are Christians, Jews or followers of other prophets; because the belief of a Muslim cannot be perfect unless he believes in all the Prophets and books revealed to them. The attack over Islam was an attempt to spoil the Eid of Muslims. Every Muslim is sorrowful due to this attack. Muslims should wake up now. 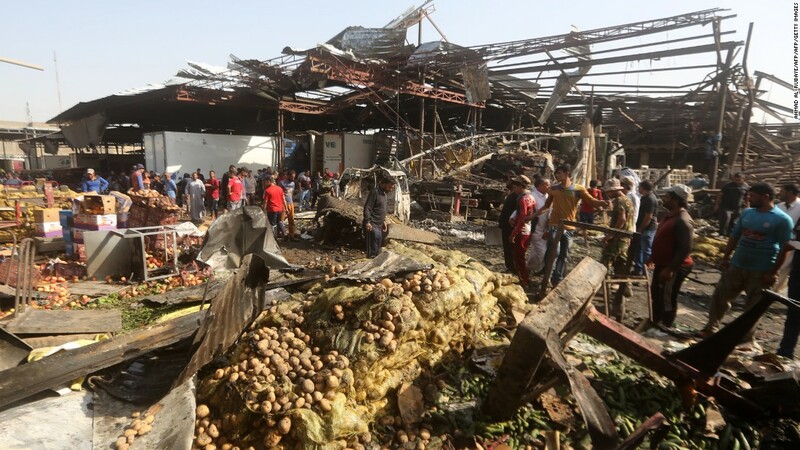 They should pay attention that before attacks in Madinah, on 3 July 2016, the walls of Baghdad were jolted by the bomb blasts in which including men, women, children and elderly 130 people were killed and 140 got hurt. Bomb blasts targeted those public areas where big number of people was busy in shopping for Eid. 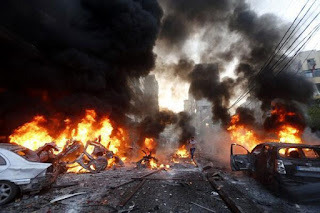 Such flammable / explosive material was used in the cars for blasts which can maximize the fire. That is why as a result of these bomb blasts buyers and shopkeepers were taken by the fire ferociously that they could not get chance to escape. ISIS (DAESH) accepted the responsibility for the blasts and threatened to conduct more such bomb blasts. The main target of such threats was to spoil the happiness of Eid. 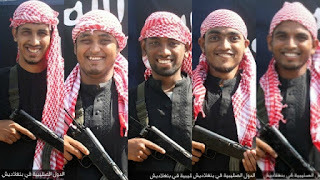 Few days ago ISIS targeted the restaurant in the most sensitive diplomatic region of the Dhaka in which two Police officers, Bangladeshi woman and 22 foreigners were targeted by the firing of 6 terrorists. On the night of 29 June 2016, terrorists targeted Ataturk International Airport with three bomb blasts in which 51 persons lost their lives including 23 Turks while rest were foreigners. According to eye witnesses three terrorists armed with AK-47s entered airport and started indiscriminate firing and afterwards blew them up with suicide jackets. Central Asia, Iraq, Libya, Syria and Afghanistan are facing terrorism since long. 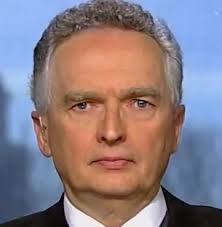 Few American analysts are of the view that why USA and West did not express solidarity with Muslims on bomb blasts in Islamic countries just like they do with Paris or Orlando. Does this mean that differences have been developed between Islamic world and non-Muslim world and Muslim countries are being destroyed becoming target of some unknown conspiracy. 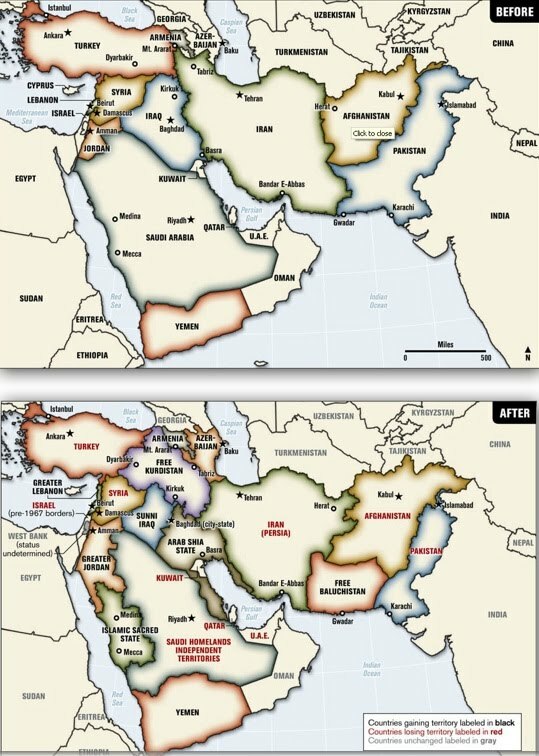 Let us talk about the theory about division and destruction of Muslim countries and changes in their territories so that one may understand that what is happening with Muslims and what is going to happen? If Muslim rulers do not wake up and stop licking the feet of West for remaining in power at the cost of their motherlands then no one will be able to save Muslims from further loss and in the history, Muslim rulers would be taken as enemies of Islam. In June 2006, US magazine Armed Forces Journal published the maps which included the article BLOOD BORDERS that was published on 9 January 2006. This article discussed dividing and changing Arab states, Turkey, Iran and Pakistan in order to ensure peace in the world. 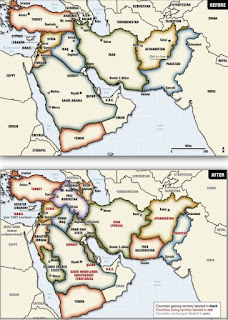 Author of the article with the support of the maps attempted to brain wash West and so called developed world that due to the Geography of the present Muslim countries, the inhabitants of these countries are facing extreme dispersion that results in the terrorist activities like 9/11 for the developed nations. Ismaeli, Bihai, Shia, Kurd, Baloch etc. have been divided due to the land borders and whole world is facing extremes of unrest and extremism. Wahabi sect of Muslims is exploiting this situation for spreading extremism and terrorism in which Pakistan and Saudi Arabia are the top game players. Thus it is necessary that the borders of these countries should be re-aligned on the basis of blood relations, sect and tribes. Perhaps that is why he gave his article title of Blood Borders. In these maps Pakistan’s link with China has been removed by showing the entire Kashmir as part of India. Pakistan has been shown limited to Sind and Punjab, Balochistan has been shown as part of Greater Balochistan and KPK as part of Greater Pakhtunistan. The editor of Armed Forces Journal also published the stance of the US govt. as well which unwanted and suspicious. The representative of White House reacting to the article termed it as the innovation of the author which is impracticable. Another important aspect of the article is that the magazine for publishing Blood borders is used by the govt. semi govt. think tanks, Defense Ministry and Pentagon while no one knows this magazine out of USA. Let us now look at the internal situation of Pakistan, the voices being raised from within Pakistan, time of change of name of NWFP, statements like “KPK belongs to Afghans”, exploitation of two Islamic states territory by Indian RAW for separation of Balochistan by terrorism for last two decades, the behavior of America and Western powers etc. One will realize that Pakistani is target of such grave conspiracies. In the way TTP made strongholds in inhabited areas of tribal areas, FATA, Northern and Western Waziristan. TTP targeted Pak army, Installations, GHQ etc. In such situation if Pak army had reacted violently killing civilians, than this war would have got violent, tribal people would have stood against Pak army, which would have reinforced propaganda spread by India, USA and West that Nuclear Weapons of Pakistan are unsafe so international powers should take them into their custody. This was the plan of the enemy. However, Pakistan army and nation stopped these conspiracies by sacrificing their lives but the threat has not been neutralized totally. The friends of enemy are present within Pakistan who have businesses and interests in India more than in Pakistan. Central Asia is burning in the fire of lawlessness. In the way Iraq was destroyed under the garb of the fake charges of the weapons of mass destruction, the history is yet to be written. The supporter of attack over Iraq, ex-British PM Tony Blair has apologized for the Iraq attack and confessed that on the basis of fabricated documents, they paved way for the attack over Iraq in which 2 million peoples have been killed. While, no one knows about the numbers of those who got hurt, handicapped, lost houses or livelihood. After destroying Iraq, US and its allies attacked Libya in the name of democracy on which now ex-US rulers are apologizing. America and its allies took booty from the state treasury of Iraq and Libya which is unaccountable. The gold present in the banks, private financial institutions, gold hidden in the mansions of the rulers of Iraq and Libya were transferred to the attacking countries while booty from the oil resources as well. After destroying these two strong states, west targeted Syria. For targeting Syria, not only sectarian issues were fueled but deals with rulers of Muslims were also finalized. On July 1, 2016, a group of militants attacked the Holey Artisan Bakery in the Gulshan diplomatic area of Dhaka, Bangladesh. Turkey while on the other hand USA is supporting Kurds for fight against ISIS. Some countries having sectarian disputes might consider that by supporting US interests they may protect their country or sect. But the history shows a different story that whenever Muslim became target of mutual disputes and differences, enemies of Muslim exploited the situation. Muslims got only destruction. India, Israel or USA are fueling internal disputes of Muslims in order to start fight between them. Whether they are Taliban or ISIS, Al-Qaeda, all were established by USA and Israel. If we close our eyes behind the establishment of these terrorist organization than this would be our own negligence. Otherwise neither the role of Israel is hidden anymore nor the interests of USA are secret whose economy depends upon the war, looting and sale of weapons to the militants and insurgents. Look at the history of last 100 years, USA would be either supporting any country indulged in war or directly involved in the war. Date: 17 to 23 July 2016.